Scrap boring, hard-to-see photo collages and make them fancy with Frametastic to attract more eyeballs and get more exposure. I love the bSafe app because you can set it up once to keep all of your closest family, friends and even your broker aware of where you are. TourSimply.com allows your home seller to input the dates and times he or she is available for home showings; and then once you know the potential buyer’s schedule, you can add showings to your and the seller’s schedule. Do you strive to maximize your time and profits while doing what you love — selling real estate? I’m sure you do. And if so, then these seemingly unspectacular mobile apps are laced with impressive capabilities to help you keep this positive status. In real estate, a picture might be worth a thousand views and several new clients. Scrap boring, hard-to-see photo collages, and make them fancy with Frametastic to attract more eyeballs and get more exposure. Frametastic is an app that turns your real estate collage photos into moving pieces of art. Frametastic is for you if you are on social media (you should be) and you are posting photo collages (you should be) of your happy clients at closing, your listings or other snap-worthy events in your business. Frametastic is an app that turns your real estate collage photos into moving pieces of art. Safety is something we all want but which we might be too busy to plan for and monitor adequately. I love the bSafe app because you can set it up once to keep all of your closest family, friends and even broker aware of where you are. BSafe can be set up to keep all of your closest friends, family and broker aware of your location. If you need an excuse to walk away, the app also provides opportunities for you to get a fake call. It can also send out a distress signal, automatically record video of yourself and surroundings once you trigger a distress alert, and instantly alert your loved ones of when you have made it safely to a destination. After you initially install and set up the app, all you have to do is remember to keep your phone with you and your GPS on. Do you have a client who is hard to reach? Or one who might be prone to forgetfulness? If so, then you might have a rough time scheduling home showings. TourSimply.com is an excellent solution. It allows your home seller to input the dates and times he or she is available for home showings. 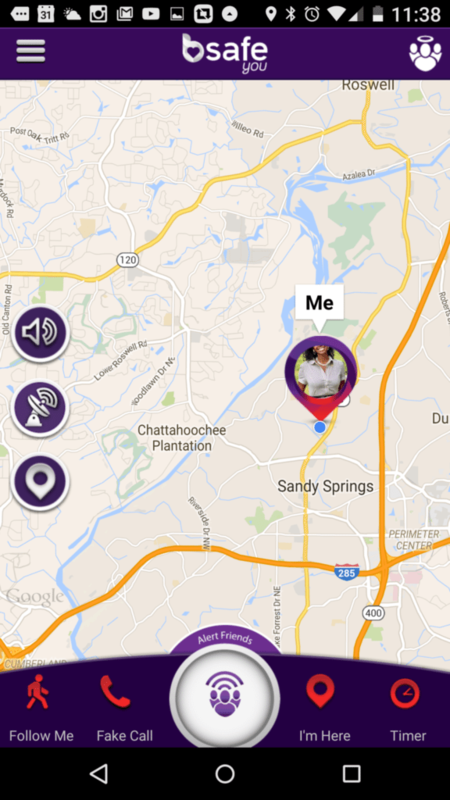 TourSimply.com uses your seller’s availability to let you schedule showings and share the calendar. Then, when you have a buyer ready to see the home, you add the showing to the seller’s calendar, and they get reminders either by text or email. This app is especially great if your client is not into using and sharing a Google calendar (which is very similar). TourSimply.com can be used on any computing device (phone, tablet, desktop, etc.) as long as the device has Internet access. It’s easy. Pushbullet is a productivity tool that can help you get away from bouncing between phone, tablet and laptop. There are still some things that you can do only on your laptop. Instead of having to look at every alert, ding and buzz on your smartphone or tablet, Pushbullet allows you to see the alerts on whatever device you are on. Pushbullet allows you to see alerts on the device you are on — no matter where alerts come from. 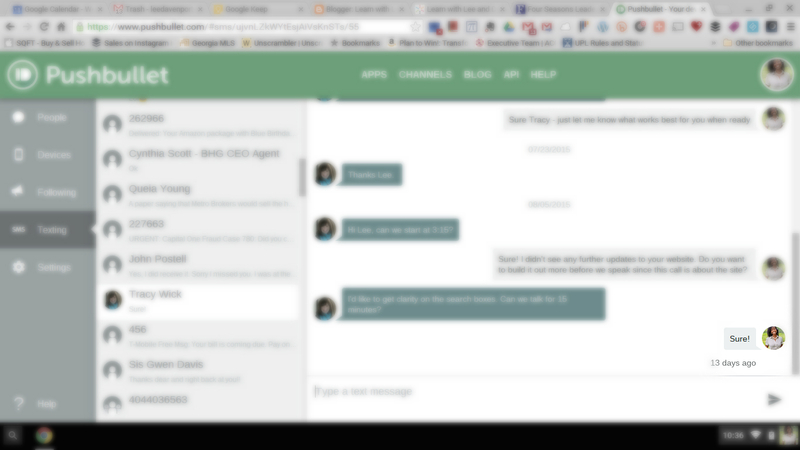 For example, from my laptop, I can see who is calling me and who just sent me a text with Pushbullet (see the screenshots below). Of course, it doesn’t take much time to check multiple devices, but checking your phone for five seconds can throw off your thought process. It’s an interruption and distraction that can reduce your productivity. There are many other app features than this, so explore Pushbullet to see how it can benefit you. 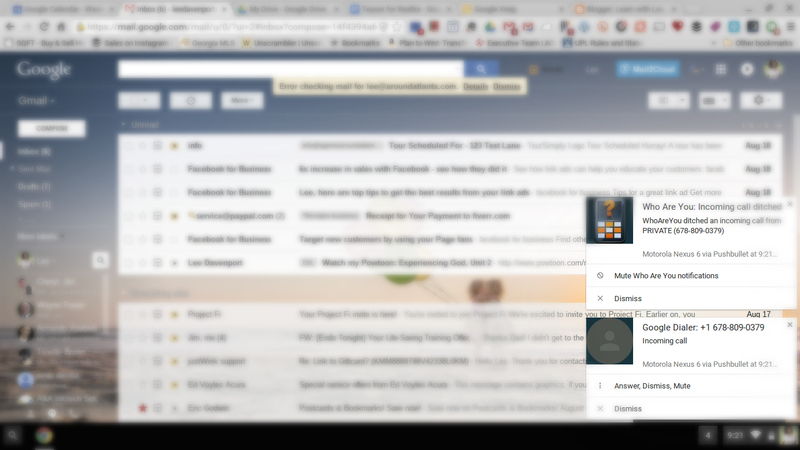 Screenshot of getting a call that can be answered by laptop. Screenshot of reviewing old messages and writing new text messages from laptop. You know real estate, and you know when a home is missing decor that could get it sold faster. Help your clients understand how to take their home from livable to sellable with the Autodesk Homestyler 3-D Room Designer app. Does your client have an empty bedroom that looks smaller in pictures because there’s nothing in it? Or could some rooms stand to be repainted or have a flooring change? This app can help you convey the impact a little redecorating (or on a larger scale, a professional home stager) can make in getting a listing sold at top dollar — for free. Autodesk Homestyler 3-D Room Designer app helps you show the impact of redecorating — for free. I hope you see how these apps can benefit your business as much as mine. Get more tips and techniques by following me on Facebook and Google Plus. Plus, if your business is lacking a strategy, get a complimentary copy of “Plan to Win!” (the workbook that will help you transform your sales game plan) for the first eight hours after this story is published. Claim this offer before the deadline by simply following me on Instagram (IG) and then sending me a direct IG message requesting your complimentary copy. Here’s to your success.